Since always our safety has been in our hands. To ensure this fact further, because of the latest Android and iPhone updates, we are able to make our loved ones know about our whereabouts or where we are going or coming from. In short, through few simple steps we are able to share our real-time location with all our near and dear ones. 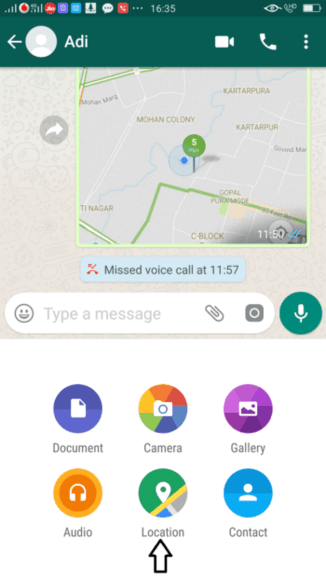 There has always been the feature of sharing the location via WhatsApp but that isn’t the location in real-time. This feature is now working on both, Android and iPhone. 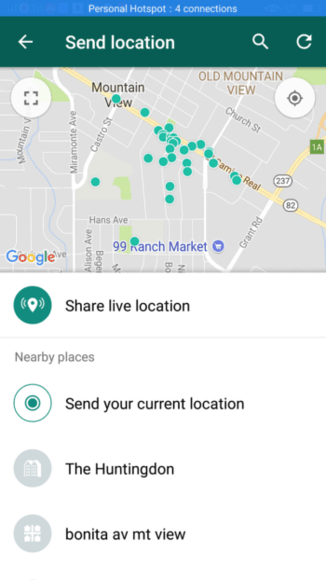 This article will help you to find out how you can share live location in WhatsApp on iPhone and Android. 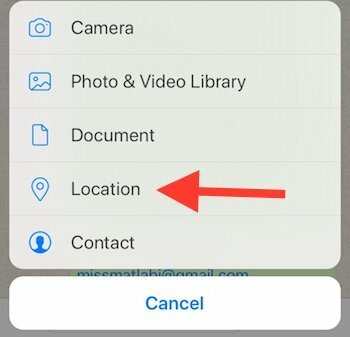 Do not worry as these steps to share real-time location on iPhone and Android in WhatsApp are very simple. Find out how you can do it. 1. The prerequisite is to have the latest version of WhatsApp on the phone. Launch WhatsApp and open any group or individual chat on it. 2. In the left hand bottom corner, tap on the + button. 3. From the various options that come up like Camera, Photo & Video library, Documents, etc. select the option of Location. 4. A map opens up showing our current location. 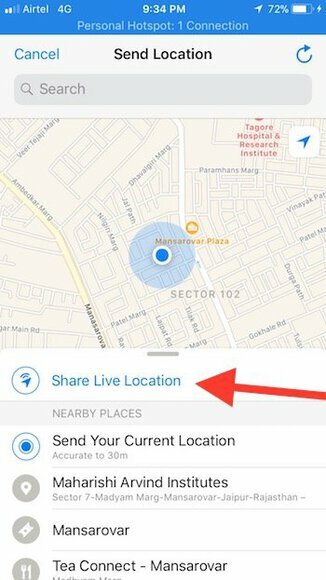 Below it is the option Share Live Location. Tap on it. 5. Then, you need to choose for how long you wish to share your real-time location, you may also add the comment. Once done, tap send button. 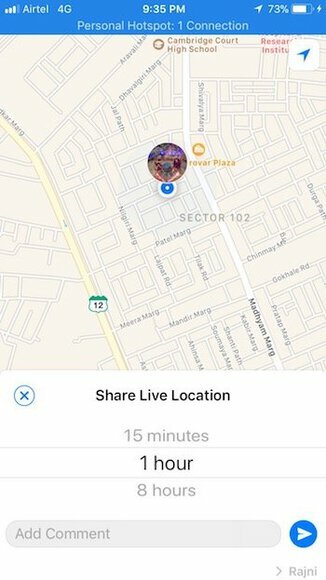 So, this is how you can share live location in WhatsApp on iPhone. The people who are there in the group or the individual person will be able to see your location as he/she taps on the message received. If you wish to stop the sharing of location, just in the group or individual chat, click on ‘Stop Sharing’. 2. In the right hand corner, tap on the Pin icon. 3. From the various options that open down, tap on the Location option. 5. 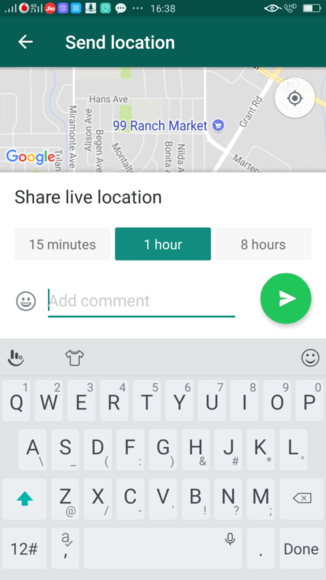 You can enter Comments, enter the Duration for the real-time location sharing, and tap on Send button. 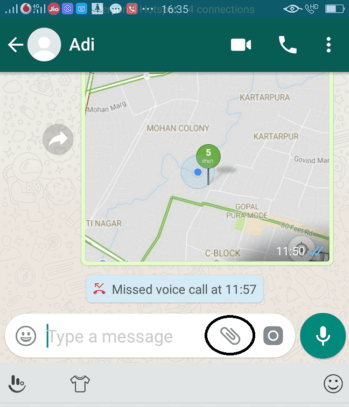 So, this is how you can share live location in WhatsApp on Android. This way the person will be able to track you in real-time and your safety will be ensured. Similarly, opening group or individual chats, through ‘Stop Sharing’ we can stop sharing the location. 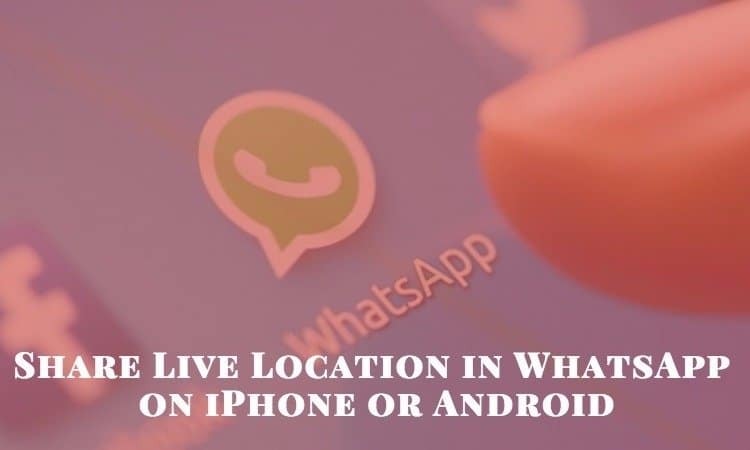 We hope that it is easy to follow the tutorial and helps you to share live location in WhatsApp on iPhone and Android. If you face any problem, do let us know in the comments section below.